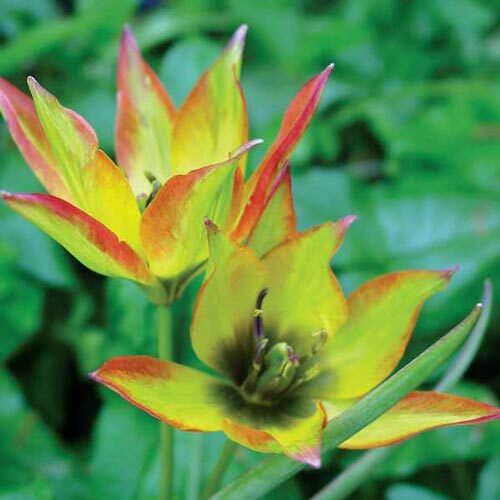 This lovely multi-flowering species (botanical) tulip has green-yellow, 2" flowers with red pointed tips. The outer petals also show a hint of orange, and the linear leaves are gray-green. Endemic to western Turkey, Greece and Bulgaria, orphanidea 'Flava' is more delicately colored than other varieties. It's an ideal choice for rock and woodland gardens, and can also be grown in containers. Growing 7-9" tall, this easy-to-grow tulip blooms from mid to late spring. It attracts pollinators and butterflies. 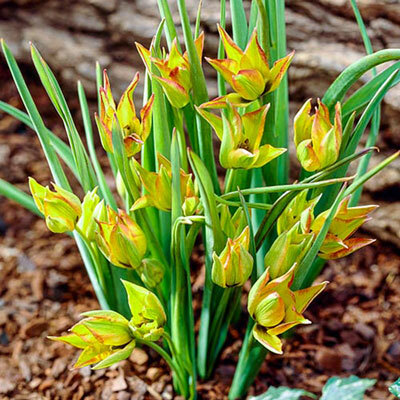 For best results, plant the bulbs in well-drained soil in full sun to partial shade. This 1970 Award of Merit winner also perennializes well. Bulb size: 5-6 cm. 2" flowers with pointed petals. 3-4" deep and 3 - 4" apart.